St. Patrick’s Day is just around the corner!! I’m so happy that I took the time to make some shaker tags for this project! I used the Mama Elephant Jar Shaker die and it comes together so easily. These jars came together in about an hour! Which is fast for me because interactive tags or cards are not my thing. LOL! I used some Hello Bluebird stamps and alpha dies for these along with the Scallop Tags Trio by Mama Elephant. I love the Rainbow stripe Doodlebug Washi tape on the tags. 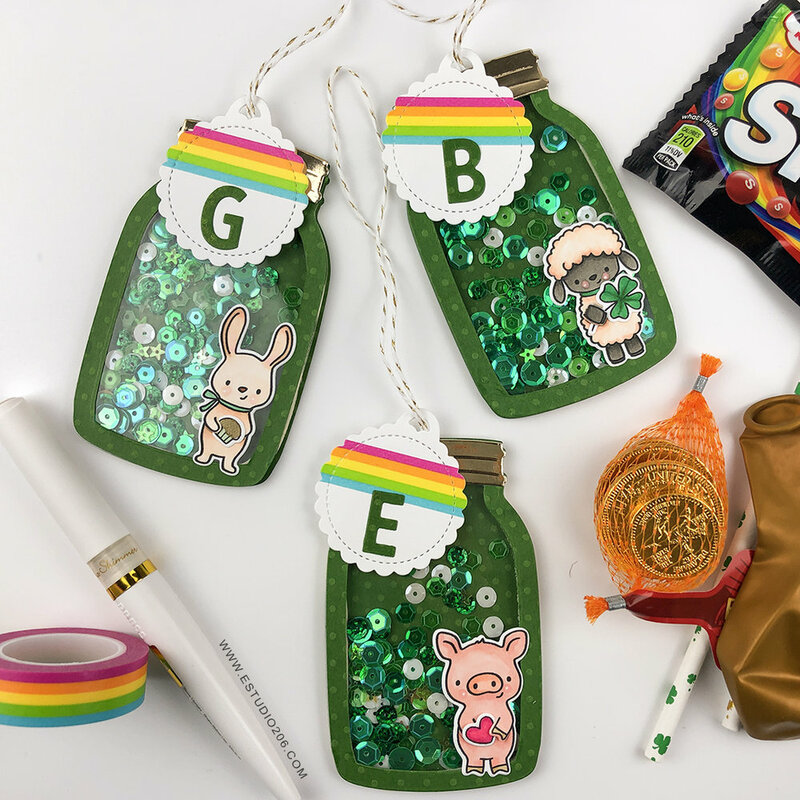 It works great for St. Patrick’s Day or a birthday tag with a cute little unicorn! I ordered some small muslin bags from Amazon to decorate with my kids’ names. I found some gold glitter iron-on that I used with my EBE Classic Block Alpha. The glitter iron-on wasn’t too expensive and it worked great. Since the letters are so small, I have lots left over for other projects. Now that I know the glitter iron-on works well with dies, I’m thinking up all kids of other projects with some of my other dies! I also added some cute paper straws to their gift bags. I have paper straws for every occasion. My kids LOVE them and I like the added touch of festiveness they add to their gifts. I picked up some cellophane bags at Daiso (a local Japanese dollar store). I put the muslin bags filled with candy, some rainbow Airheads and misc goodies in the cellophane bags. Then I topped them with the shaker gift tags I made. 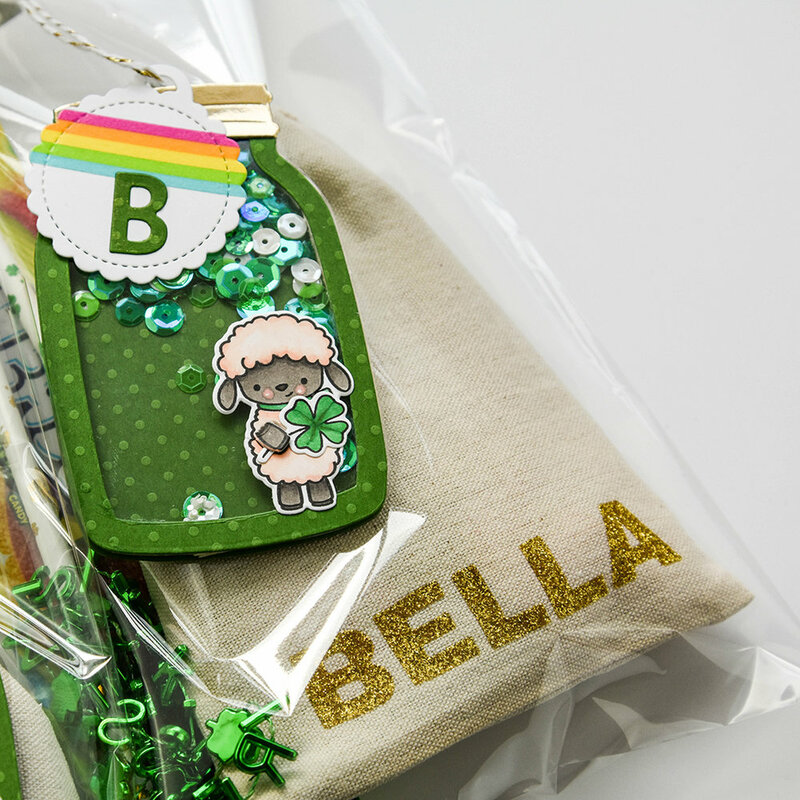 I hope this inspires you to created holiday or birthday gift bags of your own! Thanks for stopping by today & happy crafting! Today I’m using a couple of my favorite dies to create a quick and easy card! With some puffy clouds and grassy hillside dies, it’s super easy to create a cute scene with the new Little Gentleman image. The first thing I did was cut the puffy clouds from some 110lb cardstock. Then I used my life changing blending brush with some broken china distress ink. I very lightly added color to one side of the puffy clouds and then adhered them to an 80lb cardstock card base. Once my scene was created I stamped the Little Gentleman + a couple of his accessories on some 110lb cardstock and colored him with Copic markers. I adhered him + his accessories to the right side of the card front using my Lawn Fawn glue tube. Then I stamped the sentiment “play all day” using some VersaFine Clair ink. If you have not tried the VersaFine Clair ink in Nocturne, I really encourage you to give it a shot! It is my absolute FAVORITE ink for stamping sentiments in black. I cannot say enough good things about it. 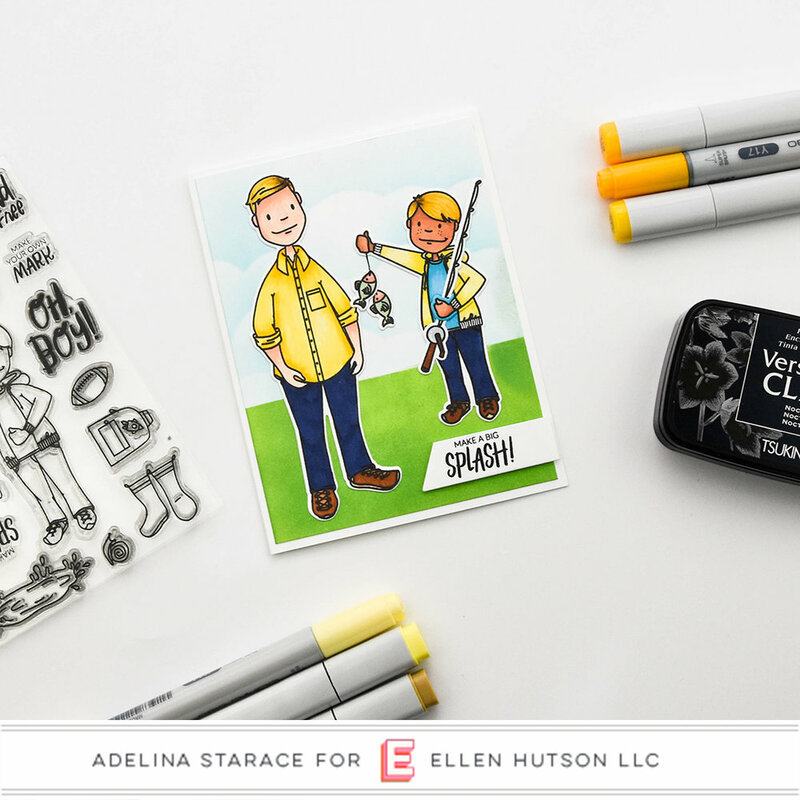 CARD TIP: When you're in a pinch for a quick card, just reach for a couple of fun dies to create a quick, no-color scene. I could have easily cut the puffy from some light blue cardstock and it would have looked great. You can do a fun scene with die cut frames or borders and a just add any one of the Leading Lady family members + a sentiment! I hope this card inspires you to try a quick and simple card of your own. Thank you for stopping by today and happy crafting everyone! 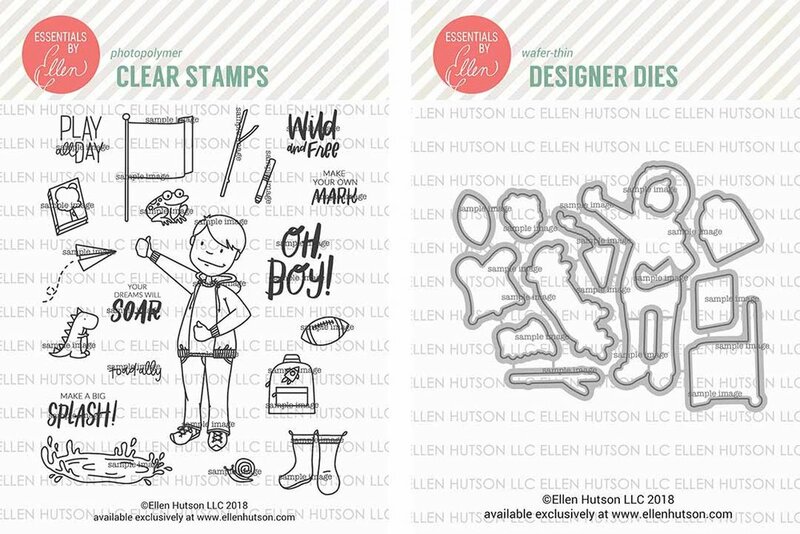 It’s release day at the Ellen Hutson shop!! The new Leading Ladies family is growing once again and my favorite part of this release is the Little Gentleman. He is the cutest! For today’s card I created a little father/son fishing scene. The fishing pole and fish are from the Leading Gentleman set. That’s one of the fun things about all the accessories for these sets, they’re interchangeable! I cut down some white cardstock to 4” x 5.25” and then masked off the upper portion to create a grassy area. Using my foam blender I colored the bottom of the card with some Distress Ink in Mowed Lawn. Then I masked off that lower section and used a cloud stencil to create some puffy clouds. I like to use Distress Ink in Tumbled Glass for my cloud background. It’s a nice, soft blue color. I stamped the Leading Gentleman and Little Gentleman on some 110lb Neenah Solar White cardstock with my Memento Ink Pad in Tuxedo Black. CARD TIP: I like using the heavier cardstock for the die cut images when I’m not popping them up with foam tape. It’s a personal preference, but I like the way it looks. Then I colored them up with my Copic markers. I used a lot of yellow on this card (I listed them below), I think I’m really missing the sunshine right now! *laugh* This dad and son pair were dressed similarly for this special fishing trip! I adhered the completed layout to the front of some 80lb Neenah Solar White cardstock. Then I stamped the sentiment with VersaFine Clair Ink in Nocturne and cut it out. (Probably the ONLY ink I use when I’m stamping sentiments in black. It’s amazing!!) I adhered it to the card front with some foam tape and called it good! Thanks for stopping by today, I hope this Little Gentleman finds his way into your heart. Happy crafting!